Tucked behind the Animas River, near downtown Aztec, the ruins take you back in time, back 900 years! 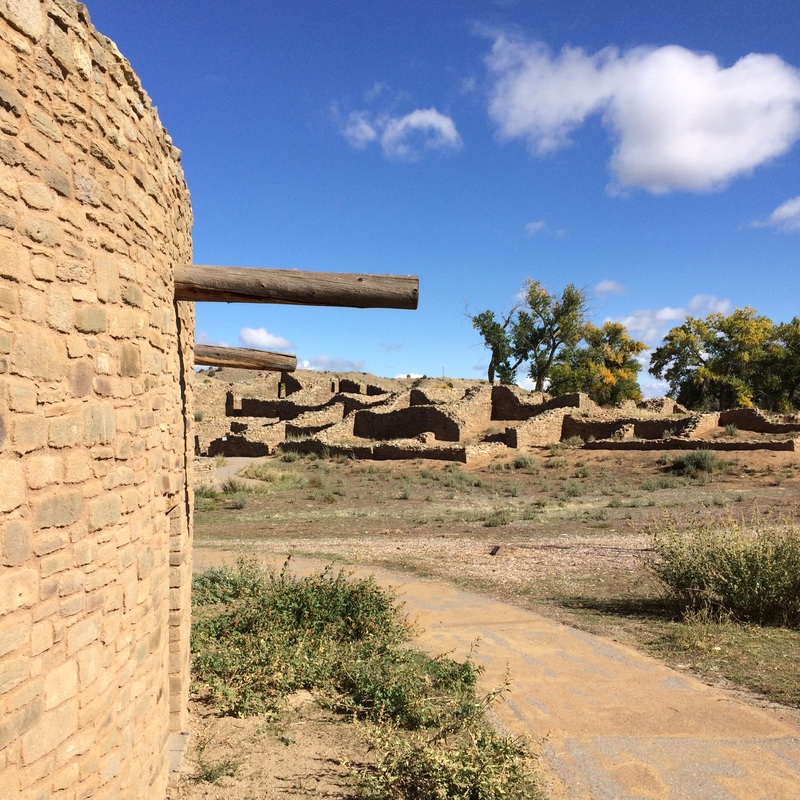 The Pueblo Great House had 400 rooms, many you can walk through on the self-guiding tour. This is a great walking tour, I had to crouch down to get through several doorways. 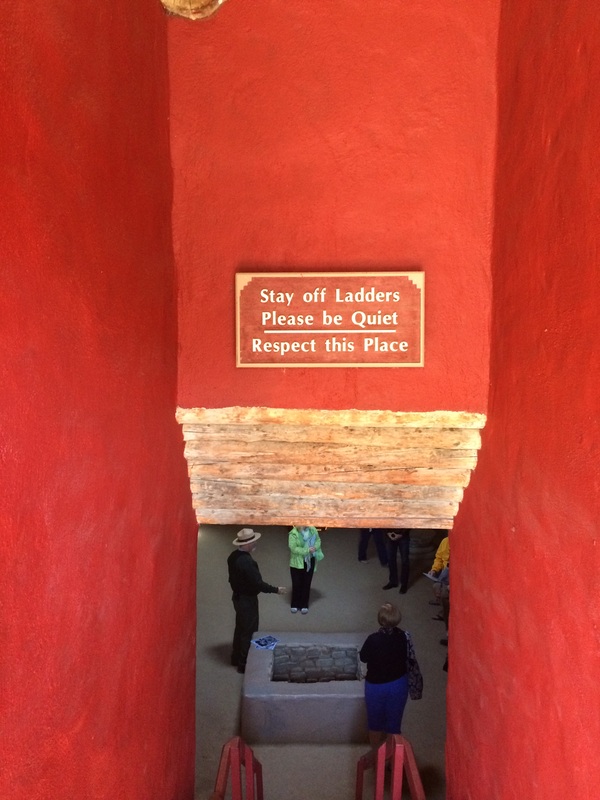 The large kiva, spiritual center, has been restored so that you can walk down into the center. The overall area is small, but what you can experience is big! 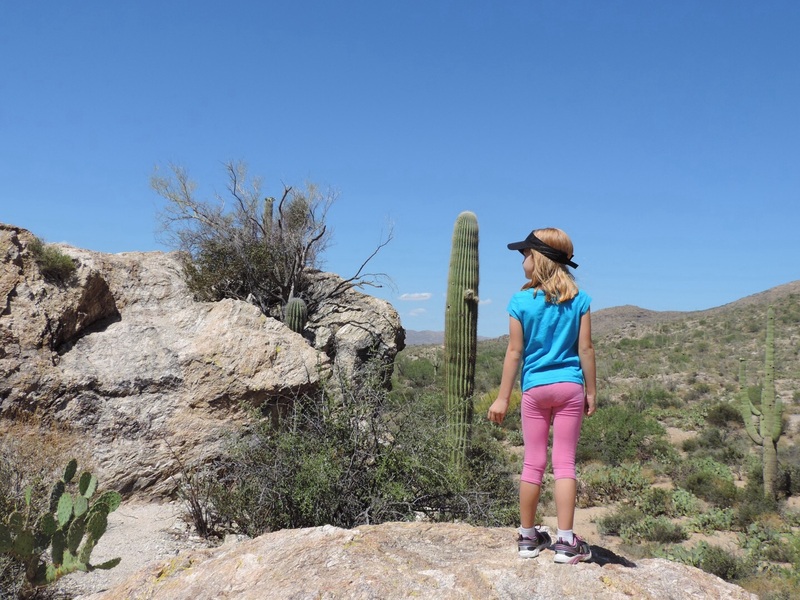 Aztec Ruins offers a number of Junior Ranger programs for different age groups and this senior ranger program. And even better, you can earn a patch at home! Following the link below you can complete the activities online to earn their patch. The ‘booklet’ for the Not So Junior Ranger is a four-fold flyer with seven panels to complete. The only downside of the flyer is the slick paper, difficult on which to write or draw. The panels headings are; In the Museum; Artisans and Descendants, On the Trail; Keep it Standing and Roots on the Landscape, Get Involves, In the Visitor Center:Historic Trivia and Heritage Adventure around the World. The activities are a nice blend of visitor center information, exploring the ruins and expressing your opinion or thoughts. Sometimes it took some detective work to find the information which made the hunt fun. Matching pottery images to the type of pottery was the easiest, with finding the viga (beam) labeled H48 in the visitor center the most challenging. 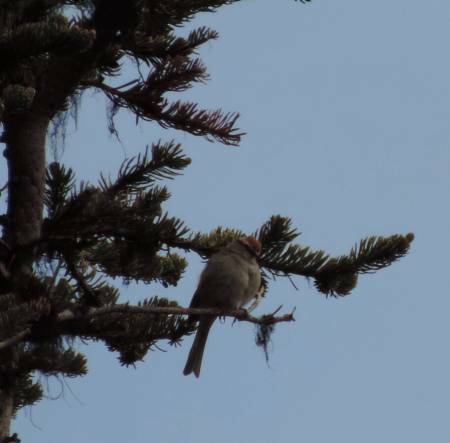 When asked what was the best part of my experience at Aztec Ruins National Monument I wrote about watching a Dark-eyed Junco bird fly in and out of an opening in the ruins. Seeing an animal, which may have been present when the ruins were occupied, brought the ruins alive for me. It was a busy day, over the Columbus Day weekend, but the ranger on duty spent time reviewing and discussing my completed pamphlet. Having a senior option available is greatly appreciated, and the slightly larger wooden Not So Junior badge is a nice reward. 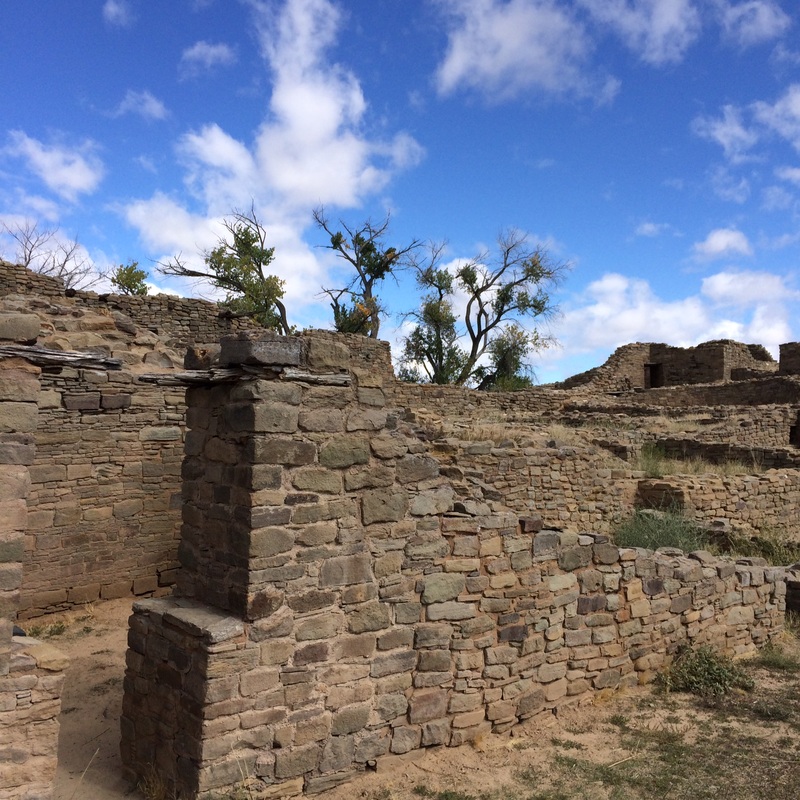 During our Spring trip through central New Mexico I wanted to visit all three of the pueblos of Salinas Pueblo Missions NM to earn their Junior Ranger badge. I had printed a copy of their booklet before leaving home to make sure I had it when I started my visit, in case one of the visitor centers was closed. Our first stop was at Gran Quivira where I completed the Junior Ranger portion for that site. After visiting there we stopped at the park headquarters in Mountainair for their passport stamps. While talking to the staff and explaining that I was working on the Junior Ranger booklet I was handed their Senior Ranger Program booklet! The three missions are miles apart and each site is distinct, well worth visiting each site. Salinas means salt and the missions are part of the Salt Missions Trail Scenic Byway. The sites promote the history of the prehistoric Ancestral Puebloan and Jumano groups, to the 17th century Spanish Franciscan missionaries, and the returning settlers of the 1800s. The booklet is easy to complete, whether visiting one of the three sites, or all of them. As we had planned to visit all three on this trip, and I was also working on the Junior Ranger booklet, it was easy to complete both programs. The activities are; Compare Historical Photos of Abo, Quarai and Gran Quivira, Plant & Tree Identification, Wildlife Found at Salinas Pueblo Missions, Pictographs & Petroglyphs, Four Churches at Salinas Pueblo Missions, National Park Service Word Search, and Salinas Pueblo Missions Word Search. 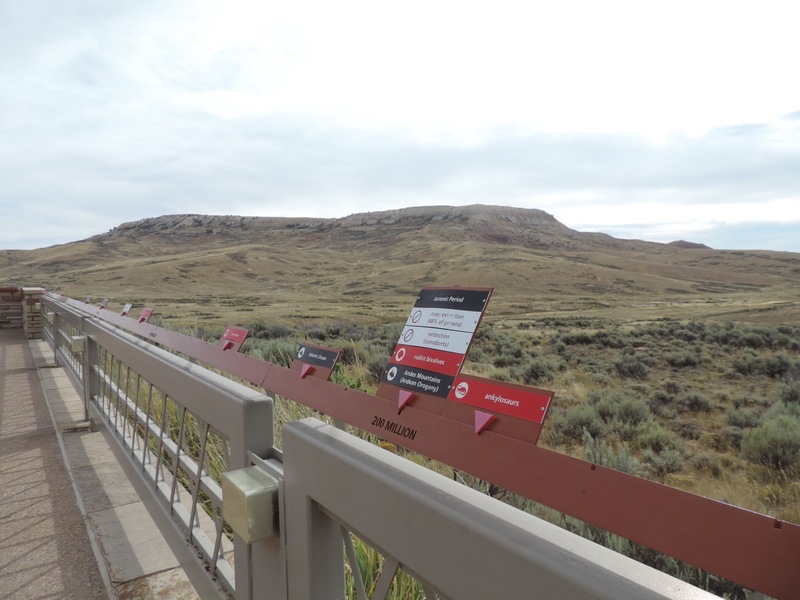 Completing this program is very easy, the booklet states that you only need to complete one exercise at one of the three sites to earn their attractive park pin. While at Quivira we sat outside the visitor center and completed five of the activities. The wildlife page had photos take by game cameras of an owl, jackrabbit, rattlesnake, elk and coyotes. A series of questions were asked about which animal you would like to see while visiting and how you should deal with wildlife, if seen. For Pictographs and Petroglyphs you draw an event in your life which can be represented by symbols. I had fun creating a series of symbols depicting my retirement from teaching and traveling. Once we finished a ranger reviewed our booklets, and we had some good discussion about the activities. I always appreciated when park staff can spend extra time looking over my completed booklets. For their Senior Rangers they award their attractive park pin. I always try to leave a donation when completing either Junior or Senior Ranger programs, but I especially make sure I remember when they provide an extra special award. 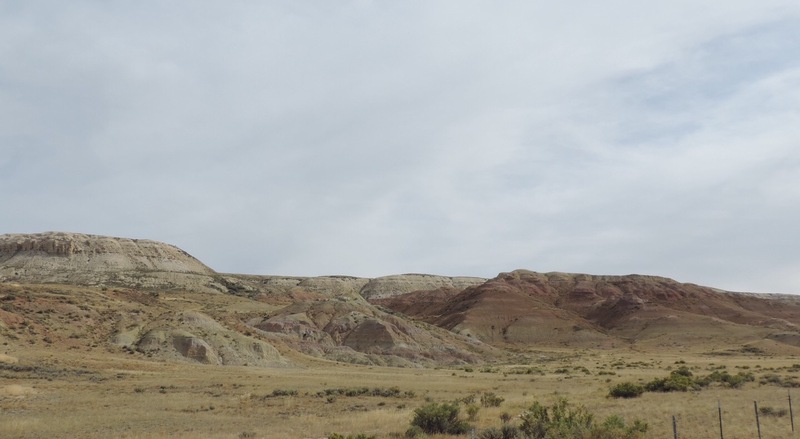 When I arrived at Fossil Butte National Monument I was pleased to find out that they have a Senior Ranger program, always what I prefer to complete. 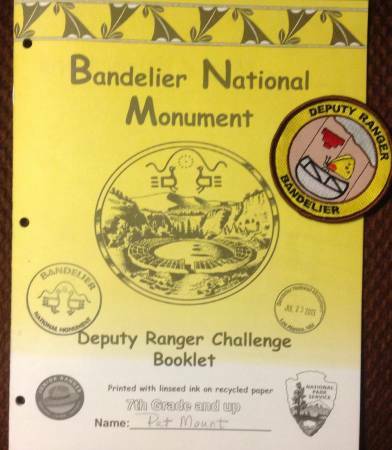 One booklet is used for both the Junior and Senior Ranger program, four age groups are listed. The age groups are; 5-7, 8-11, 12-15 and 16+. As a senior I completed the sections labeled for 16+. The activities I completed included; Walk through Time, How Big Was Fossil Lake?, Reading the Rocks, Fossils, Fossils Everywhere!, What Is It?, Fossil Preparation, Fossil Collector Biography, A-mazing Fossilization, Species Past and Present, Leafy Thermometers and Rain Gauges, A Scene from Fossil Lake and The National Park Service Mission. One of the hardest activities was ‘What Is It?’, trying to match the picture in the booklet to specimens in the visitor center took some time and detective skills. The activity of drawing seven specimens into a grid, representing layers in which the fossils would have been found was challenging. This took some concentration to get the correct size and orientation, according to the details given. My favorite activity was using line graphs to determine temperature and climate of this area based on leaf size and leaf edge smoothness. The results showed that the past climate was warmer and wetter. As you approach the visitor center there is a ‘walking geologic timeline’ that begins in the parking lot and wraps all the way around the outside of the visitor center. The activity titled, Walk Through Time, is based on the information presented along the timeline. Your steps along the way are converted into millions of years, a good way to help you understand geologic time. After camping in the area I returned the next day with the completed booklet. The volunteer at the desk reviewed the booklet and answered a couple of questions. 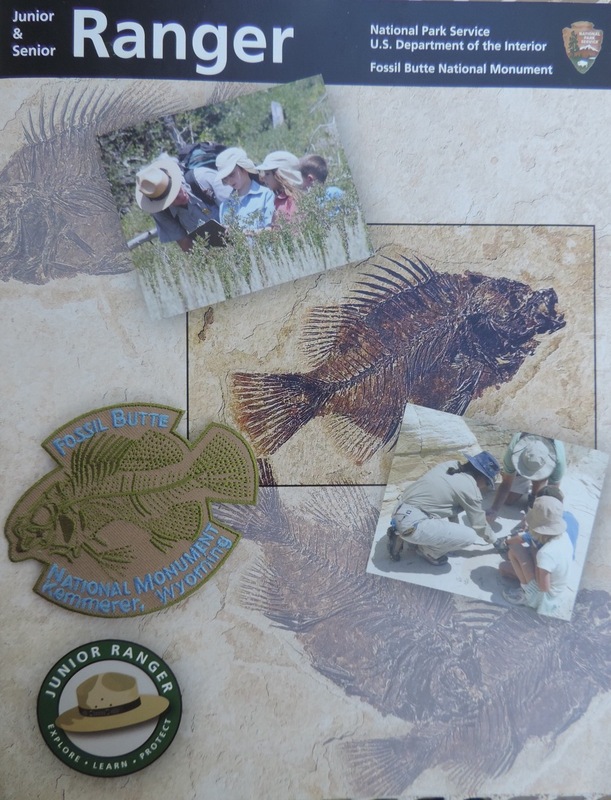 Senior Rangers receive a very beautiful embroidered patch of a fossil fish. 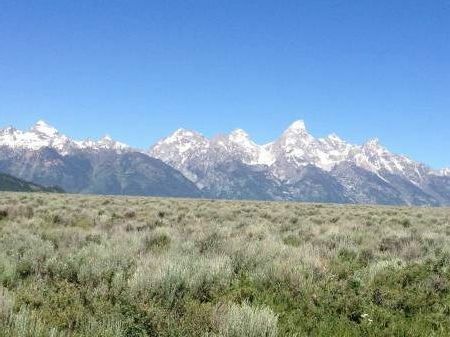 While at Grand Teton National Park I was able to complete two programs; Junior Ranger and Survivor. Both programs are considered Senior Friendly. The Junior Ranger program has two age groups, age 7 and under and age 8 and above. For this program you purchase, for $1, the activity newspaper at a visitor center. The Survivor program is designed for ages 12 – 18+, there was no charge for this program. We stayed for several days so I had time to complete both programs. 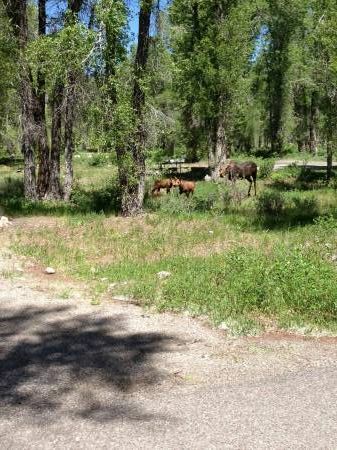 While staying at the Gros Ventre campground a momma moose (cow) with her two calves were wandering through the campground in the middle of the day. 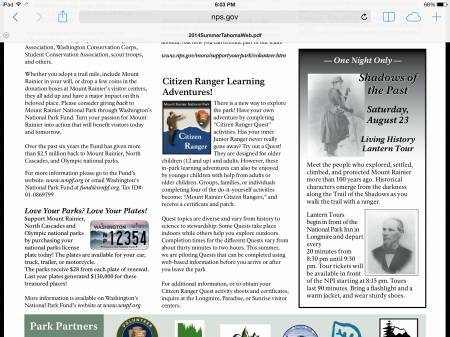 The Junior Ranger activities are printed in a newspaper. For the upper age group all of the activities are to be completed. Activities include; Open Your Senses to the Wonders of the Tetons, Glaciers Shaped the Tetons, Ranger Bingo, Where do the Animals Live?, Be a History Detective!, and Explore the park with a Ranger. The final activity has you attend one ranger program and attend another ranger program or hike a trail. The program I attended was on Bear Safety. I learned that you should flatten yourself if a bear makes contact and to aim bear spray at the feet of the bear. I enjoyed a hike between String Lake and Leigh Lake. The trail was fairly level, cool air coming off the water and clear water along the way – very enjoyable. There were two opportunities to draw, on the front page a strip at the bottom of the page has you draw a picture of the Tetons and there is a panel to design a sign to protect wildlife or wild places. The motto I used “I only have (image of a pair of eyes) for wildlife and wild places. 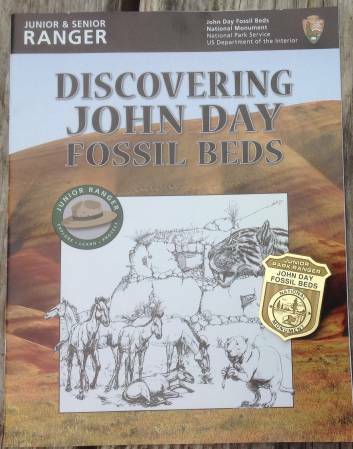 Once I completed the activities I brought it to a visitor center and was given a really cool wooden Junior Ranger badge. The image in the middle is a moose, always a favorite animal to see at this park. 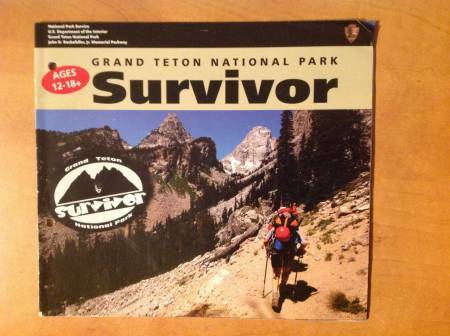 At another visitor center I was given their ‘older’ program called ‘Survivor’. This program is designed for older ‘kids’, ages 12 to 18+. The graphics throughout the book are excellent. 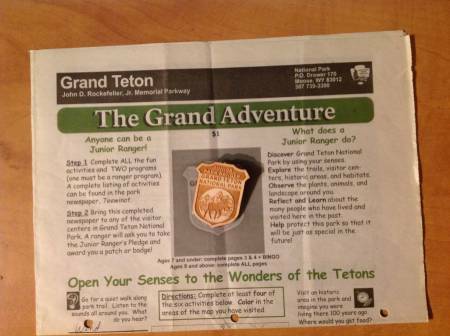 I appreciated that Grand Teton National Park has a program for older ‘kids’. There are a variety of activities; Keep It Green, Native Survival, Tools for Survival, Take a Hike, Gear up for the Grand, Community Quest, What Survives Here?, Animal Olympics, Be Bear Aware! and a section to write your own blog about your visit. I enjoyed completing all of the activities, you had to visit several locations around this park to be able to complete enough activities to earn this award. Besides getting to keep this well done booklet you also receive an oval sticker like the one on the booklet cover, pictured below. As you can see below they offer great patches for each age group. Protect and Respect, Story Puzzle & Word Search – The story portion has you unscramble words below blanks that gives you an overview of the monument and the importance to be respectful to protect these cultural and natural resources. An optional second page has you find the key words in a word search. The story page is the only page that you are required to complete, in addition to five other activities. Alien Invasion – background information on native plant species, as well as non-native or alien species is provided. There are questions that have you think about how alien plants were introduced to the park and how you would get rid of them. I did not realize that mullein was a non-native species. 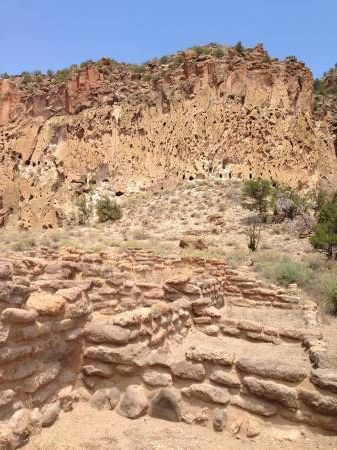 Climate Change at Bandelier? 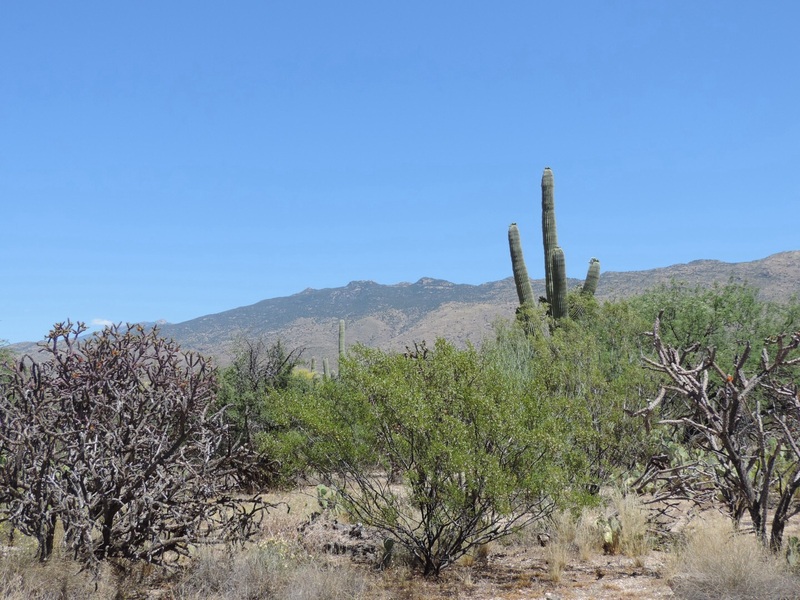 – it explains that changes in weather and plants have been studied for the past 30 years at this site and they have noticed that a significant number of Pinyon Pine trees have died at the lower elevation, over 80 %. The activity has you select a tree and follow a key to identify the tree. The tree I chose was a Ponderosa Pine. Reintroduce Native Species? – Five animal species that were present in the past are pictured. You are asked to select one and explain why you think that animal should be brought back. I chose Bighorn Sheep, they are always a pleasure to see in the wild. Monitoring Ecosystem Health – a series of questions has you explain how poor quality of air, water and suppressed fire could affect your visit. CCC Legacy – the. Civil Conservation Corp created many of the buildings and adornments at Bandelier from 1933 to 1941. For this activity you could draw or describe three architectural details from that era. I really enjoyed this activity, sitting on the patio of the retail area and working on these drawings was relaxing and challenging. Pueblo Voices – quotes from four of the near by Native American pueblo communities were given and then you give your reaction to the quotes by answers several questions. NPS: An Inside Look – a couple of questions have you reflect on NPS in general, your favorite location and why it is important to protect these special places. Reflections about Bandelier – a blank page is given for you to write or draw about your experience at Bandelier. Make your own Deputy Ranger pledge! – this page allows you to draw a picture within an arrowhead outline and write a pledge for this program. In total twelve activities were included in the book, to earn your Deputy Ranger badge you only need to complete six activities. Overall I would say I spent about an hour and a half completing this booklet. I really enjoyed the time I spent at Bandelier and working on this program. Having an adult-oriented program is greatly appreciated. Lassen Volcanic National Park offers an adult-oriented program titled “Lassen Volcanic Club”. A half-sheet of cardstock can be picked up a visitor center, Loomis Museum or Kohm Yah-mah-nee, the activities can also be downloaded through their website in advance of a visit. 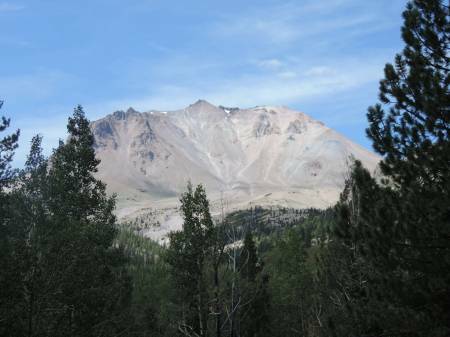 To earn the Lassen Volcanic Club certificate you need to complete seven of 14 possible activities. Traveling around the park provides plenty of opportunities. 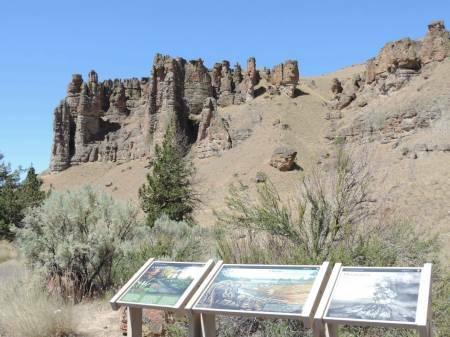 Several of the activities; listing safety rules in hydrothermal areas, name other national park sites with volcanic features, how to protect the volcanic features at Lassen and reasons for studying volcanoes can be completed prior to arriving at the park, if you wish. 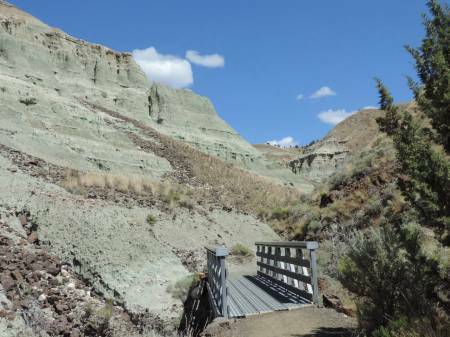 Several activities involve hiking some of the trails within the park; Devastated Area, Lassen Peak, and Cinder Cone. You can go long or short to get the answers. I spent some time at Sulphur Works to complete one of the questions. 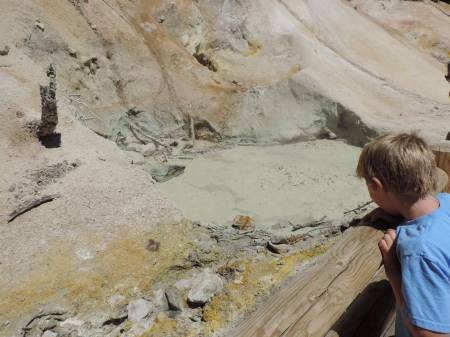 As good as any of the mud pots I have seen at Yellowstone. While at Lassen I helped my grandchildren with their Junior Ranger activities, this helped me answer one of the questions about the types of volcanoes found at Lassen. 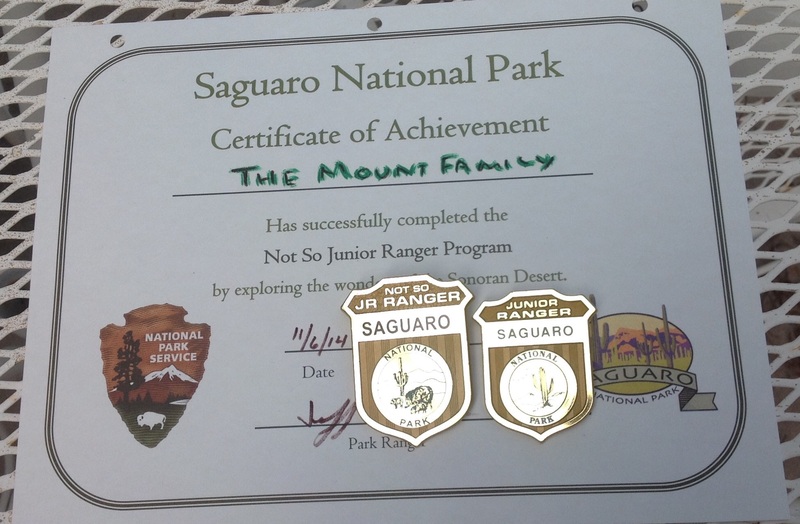 While there they were able to complete their Junior Ranger program and another program, Green Junior Ranger. The Green Junior Ranger program focuses on what kids can do to preserve the environment. Unfortunately the rangers told us the program would be discontinued when they ran out of badges, they only had a few left. 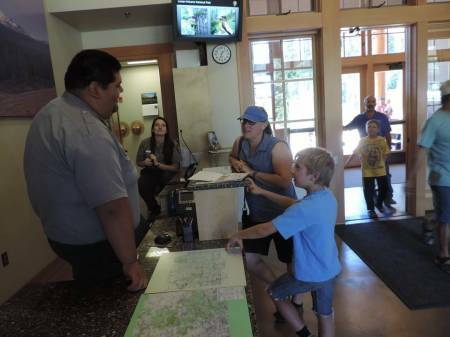 Rangers at the visitor centers seemed interested in keeping the program going, even suggesting contacting the park administration to promote the continuance of the program. 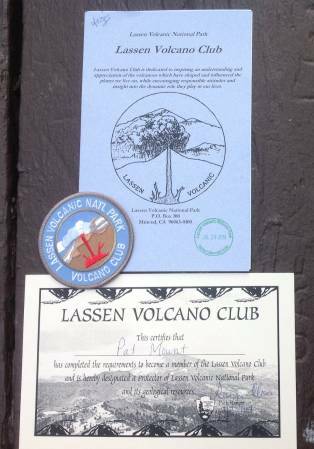 Once I completed at least seven activities I took my card to a ranger at Kohm Yah-mah-nee visitor center, she reviewed my answers and gave me a certificate as a member of the Lassen Volcano Club. With that certificate I was able to buy an attractive patch at the bookstore for less than $3. I appreciated having a senior-oriented activity to work on while enjoying Lassen Volcanic National Park. This park is a sleeper, much less crowded than many national park sites with diverse activities. 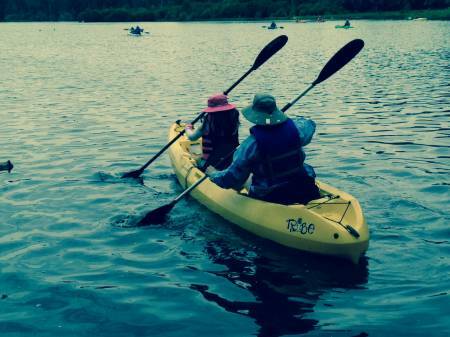 While there I went kayaking on Manzanita Lake with my grandchildren. While on the lake we saw an American Bald Eagle fly over and a Common Muskrat swam near our kayaks as it made its way to a clump of bushes in the middle of the lake. Lassen is more than just a volcano! 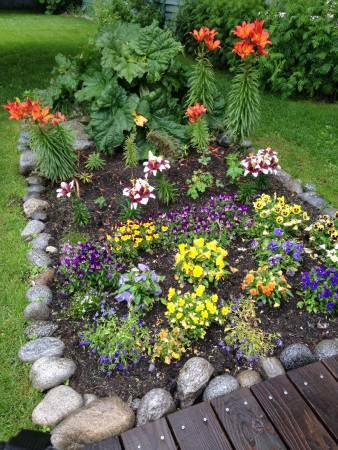 I was very fortunate this summer to be able to visit Skagway, Alaska. 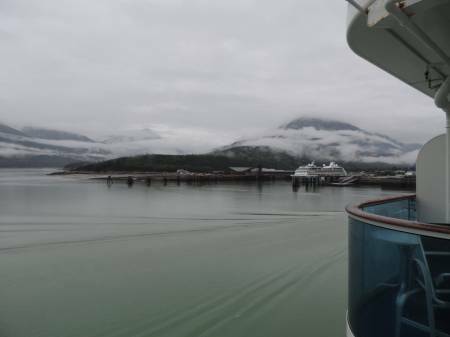 While on a southbound cruise through the Inside Passage the ship docked at Skagway for the day. We were on this cruise as part of an event with the National Park Travelers Club, http://www.parkstamps.org. 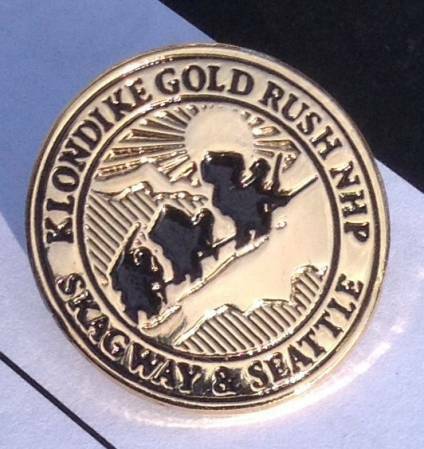 Their annual convention was being held at Klondike Gold Rush National Historical Park (NHP), both locations – Skagway, AK and Seattle, WA. 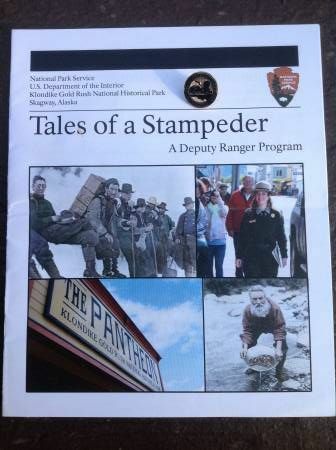 I was very pleased to learn that the Skagway unit of Klondike Gold Rush NHP has an adult program, Tales of a Stampeder – A Deputy Ranger Program. From the cruise docks a great, inexpensive city bus, SMART bus, is available to transport you around Skagway. At $2 per trip or the best deal, $5 for all day service, this was a great way to explore Skagway on a rainy day. This got us to the National Park Service Visitor Center quickly and dry! Once I picked up the booklet I was able to complete the program in a couple of hours. Besides completing at least four activities in the booklet, you also need to complete an in-park activity; movie, walking tour, talk or hike in Skagway or Dyea. While there I watched an amazing movie about the meaning of Wilderness. It was filmed in several wilderness areas of Alaska. The scenery and stories told were spectacular. Later in the day I also saw the park film that told the story of the Stampeders. This tells the story of the Alaska Gold Rush of 1898. 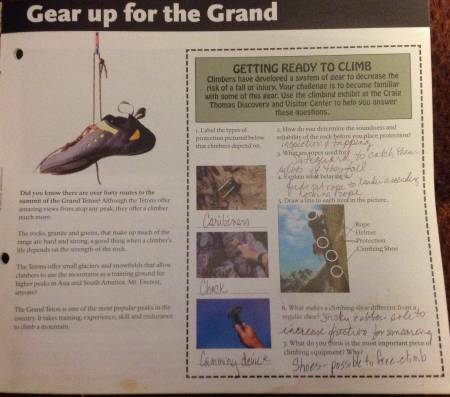 There was a variety of activities in the booklet; Which Route Would You Take?, Who Would You Be?, Historical Structure Scavenger Hunt, Journaling Activity, Ton of Goods, Gold Rush Crossword Puzzle and Cheechako? or Sourdough? Quiz. The Historical Structure Scavenger Hunt had you match buildings scattered around town with their original names. Some had the same name today, Mascot Saloon, and some were being used for a different purpose, Martin Itjen House, is now a trails center, across from the NPS visitor center. Some had been kept up, others looked as rustic as the 1890s. I enjoyed the Cheechako? Or Sourdough? Quiz which had you answer a series of questions to determine if you were a greenhorn, Cheechako, or prospector, Sourdough. Based on my responses I was a Sourdough. However, I have no plans to strike out on the Chilkoot Trail, which starts in the town next to Skagway, Dyea. Actually in 1997 when I drove up to Alaska and visited Dyea, I hiked a portion of the trail, a very short portion – it is very steep! After a lunch stop, which I used some of the time to complete activities, I returned to the visitor center and had the booklet reviewed by the ranger. Upon completion I received a very nice pin.I appreciated having a senior program to complete at this site. 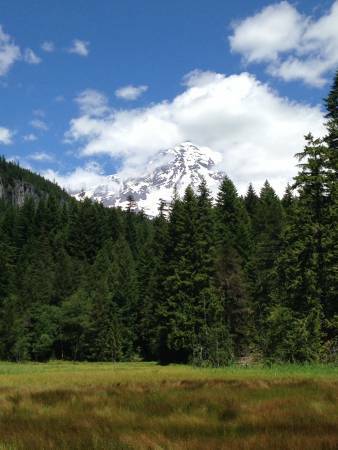 This summer while at Mount Rainer National Park, I was pleased to learn that they now offer an adult activity, along the lines of a Junior Ranger program. 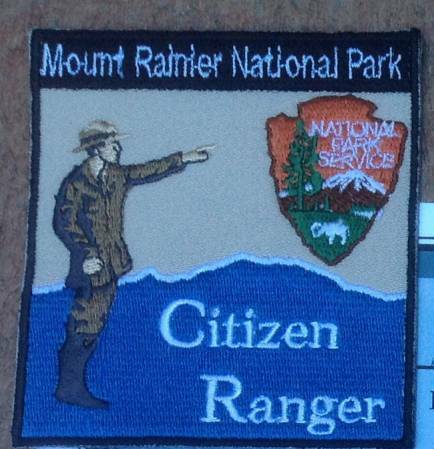 Their program is called Citizen Ranger, for ages 12 or older. 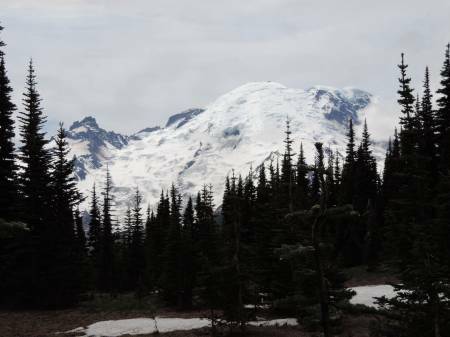 We arrived at the Sunrise Visitor Center on July 3, the first day they were open for the season. The weather was perfect, clear skies and temperate, upper 60s. 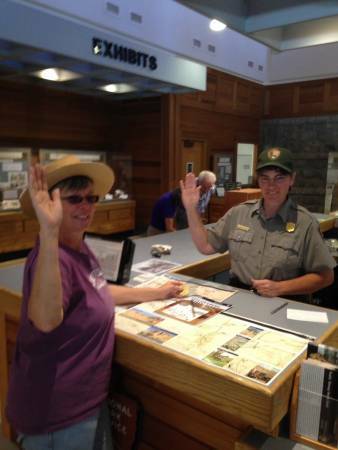 When I arrived mid-afternoon I asked about the Citizen Ranger program and I was greeted with enthusiasm by the ranger at the desk, “You’re the first to ask”. As I stated earlier they had only opened on that day. The program is very diverse, basically you need to complete four quests to earn the Citizen Ranger award and patch. Each major visitor area; Sunrise, Ohanapecosh, Paradise and Longmire has a variety of quests from which to choose. At Sunrise I completed the Journaling quest. While there I made observations and drawings on trees, birds, peaks and rocks. I spent a little over an hour exploring to gather the information I needed. When needed the rangers provided assistance. I enjoyed the activity, however one portion I found more Junior Ranger level, than adult level was the ‘Your Name for _______ (tree, bird, peak and rock). At Ohanapecosh I completed their quest, Ancient Wonder Old Growth Quest. A unique part of this program is the option to record information as a digital photograph. 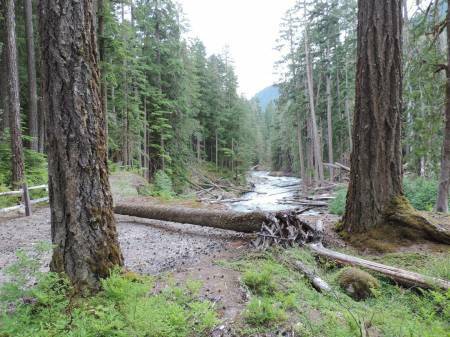 On a two-sided paper there were six questions relating to Old Growth forests. By hiking trails in the area photographic evidence could be gathered and used to answer the questions. There are several longer trails in the area, however I was able to complete the quest within the campground and the nature trail behind the visitor center. While we were there in July 2014 the visitor center was only open from noon to 4 PM. At Paradise I completed the Flower Power Quest. They had several quest options, but as a person very interested in wildflowers this was a natural for me. 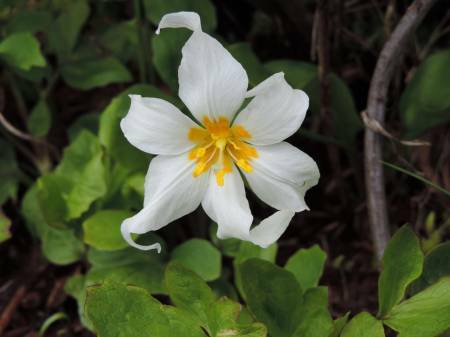 Identifying flowers was not the objective of this quest, but connecting adaptation in an alpine environment to a variety of flowers. When I choose this quest I was given an extensive hand-out which not only gave information about flower adaptation, but was a complete natural history guide about the total environment. 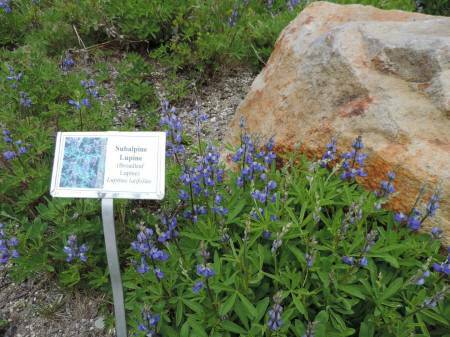 Along with the handout, outside the visitor center a number of wildflowers were labeled and happily, were in bloom. Besides describing the adaptations of the five flowers, taking photos there was a three part final question which has you give suggestions on how to protect this fragile environment. At Longmire I also had a variety of choices, as well. I had plenty of time and had not spent a lot of time in this area in the past so I choose the Longmire Amazing Adventures! It turned out to be a very fun quest. Ranger Root provided me with a strip of paper identifying six adventures, each with a different theme; Facts, History, Ecology, Stewardship, Physical Processes and Stewardship. I was given one quest at a time, upon completion, after answering just a couple of questions on each, I would return for him to review my answers then give me another adventure. Besides gathering information by reading interpretative signs in the village, viewing displays and on trails I interviewed staff, a park volunteer and a guest registrar for the National Inn. At each center when I competed their respective quest I received a quest stamp indicating the site. We were there for four days over the 4th of July and I completed one each day. I think you could compete the program in two days, maybe even one if you were very motivated. You could complete multiple quests at Paradise or Longmire. A wild card option is also available if you need a fourth quest, the rangers can further explain this option. I received my fourth Quest stamp I was awarded the certificate and a nice patch. In addition to the Quest stamp I stamped the certificate with each site’s park passport stamp. I try to do this with all programs I complete to document the completion date and location. This was an excellent adventure for adults! This is a repeat visit to a park site we have always enjoyed, but the first time for the Junior & Senior Ranger program. 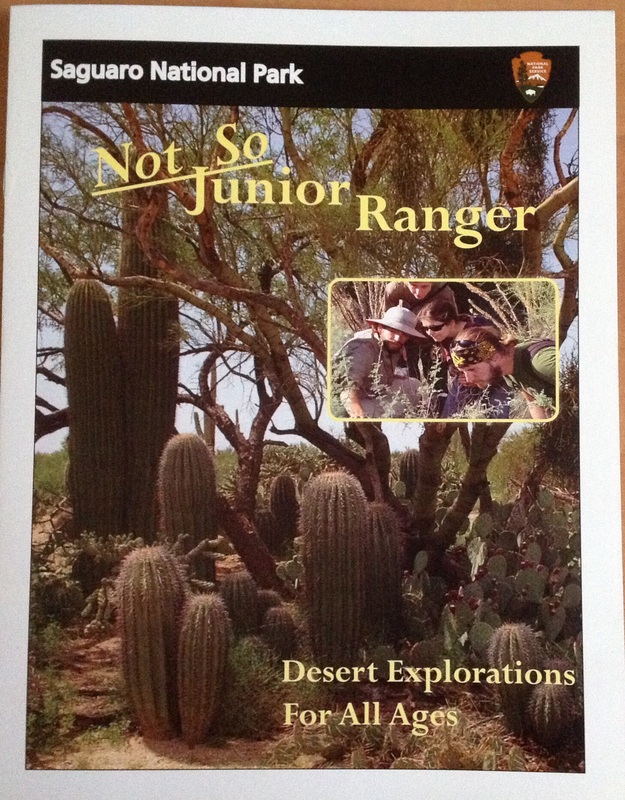 This is the first site where the front of the booklet lists “Junior & Senior Ranger”. 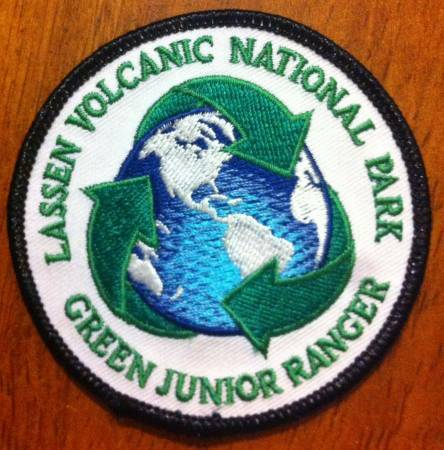 It will be listed on the Junior Ranger page because the final award is the plastic standard Junior Ranger badge. However I found the activities very challenging and I think any ‘true’ Junior Ranger would have difficulty completing without adult help. I enjoyed the challenge! We spent several hours around the main visitor center and Cant Ranch to complete most of the booklet. Ranger Michelle presented the award after carefully reviewing my booklet and giving me feedback. I appreciate when the ranger review the booklet. 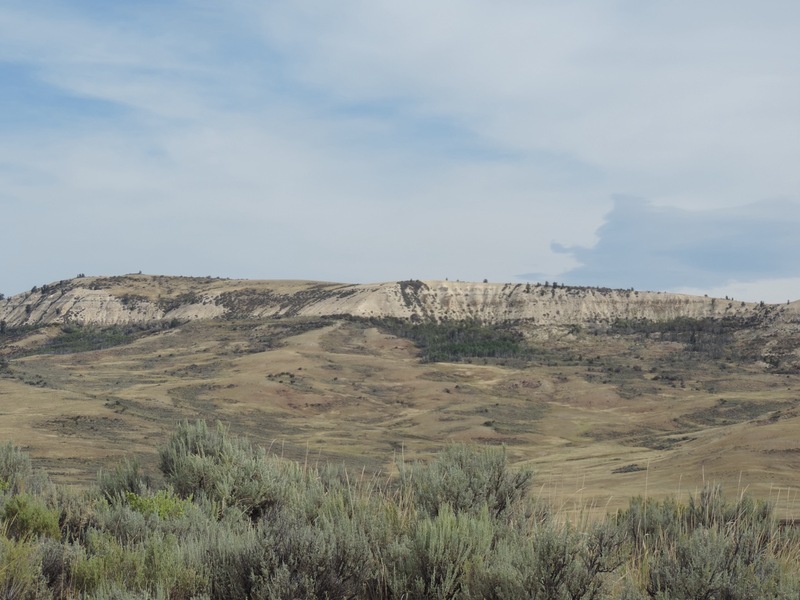 Some of the activities are titled; Map Your Visit, assemble a Skelton, Early Fossil Hunters, Fossil Gallery Scavenger Hunt, A Horse, of Course, A Trail Through Time, and Hear, Here and There, as well as others. In Map Your Visit space is provided for the passport stamps for the 3 units. The Fossil Gallery Scavenger hunt was the most difficult, but very informative and thoughtful. Once you found the animal in the gallery a thoughtful question was posed for you to answer. 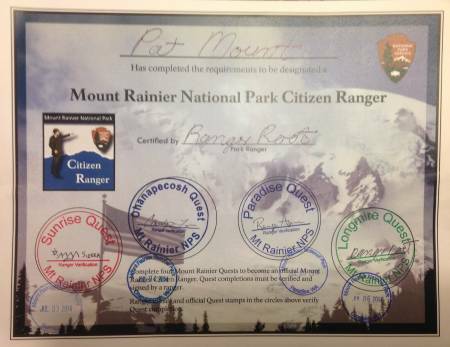 When I completed the booklet and after the booklet was reviewed Ranger Michelle asked if I wanted to take the oath. When I said yes (I think some Senior rangers do not always want to take the oath) she offered to let me wear a ‘real’ rangers hat during the oath. Very cool!